Fr. Tom takes a close look at the psalmody of the Church and its use in Orthodox worship. Father Tom discusses Psalm 137, which is included in a special way during the Matins Service for the three Sundays leading up to Great Lent. 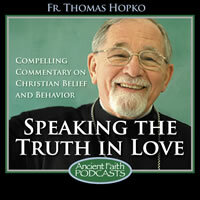 In the third part of his series on reading the Bible, Fr. Tom discusses the various English language translations that are available and offers his recommendations. A feature of Orthodox Christian liturgical and devotional life is the singing of psalms. The Psalter in the Bible is the main hymnbook of the Orthodox Christian Church the same way as it was the hymnbook of the people of the Old Covenant. In the New Testament, in the time of the Messiah, the entire Old Testament, and very particularly the psalms, which are kind of a mini-Scripture, a mini-Old Testament in doxological and devotional form, the entire Old Testament and the Psalter is read and contemplated and used for worship in the light of the risen Christ. In St. Luke’s Gospel, it says very clearly that the risen Lord opened the minds of his disciples to the understanding of the Scripture and that he showed how Moses—that is, the Torah—and the Psalms and the Prophets spoke about him. And so, in the Christian understanding of the Law, the Psalms, and the Prophets, it is an unshakeable conviction that it’s all about Jesus, that every word of the Bible is about Jesus, that you hear the entire Scripture as speaking about Jesus and understood in the light of Jesus as the Christ. Just take for example the Genesis story. Adam—the real Adam is Jesus. St. Paul says it clearly that the first Adam was a typos of him who was to come. It’s the last and final Adam through which you understand the story of the first Adam. And then all the events in the Old Covenant, the stories, for example, of Joseph in Egypt with his brothers is just a prefiguration of what happened to Christ. And then Christ is the New Moses who leads people, not out of Egypt into Palestine, but from death to life and from earth to heaven, from this age into the age to come. Jesus is the Law-Giver. In Matthew’s Gospel particularly, he sits on the mountain, giving the Law, interpreting the Torah; that Jesus is the Law. He is the Word incarnate. All the words are about the Word, and that Word is Christ who recapitulates all the words and fulfills all the words and shows the meaning of all the words in his own person, in his life and in his death and in his glorification. The King, the Prophet, the Priest—they’re all Jesus. Jesus is the King. Jesus is the Prophet. Jesus is the Priest. And then Jesus also is the disciple. Jesus is the slave. Jesus is the servant. Jesus is the one who takes upon himself the sin of the world as the penitent. That Jesus is the high priest who offers the perfect offering which is himself, and therefore the Lamb of God and all the holocausts and all the sacrificial system are fulfilled in his sacrificial, saving death upon the tree of the cross. So he is not only the high priest; he is the victim. As it says in the Orthodox Divine Liturgy of St. John Chrysostom, “He is the one who offers and the one who is offered. He is the very one who, with the Father and the Holy Spirit, received the offering, and yet he is the offering itself that is distributed to the people.” So he is all of these things, and therefore he is the righteous person. He is the perfect human being, the perfect disciple, the one who keeps the Law, the one who keeps the covenant. And then all the other symbolical things in Scripture—shepherd and lamb, rock, light, salvation—all those are applied to Christ. So it is not only possible, but it’s essential, that in singing the psalms, Christians sing them always in full awareness of Jesus, of his life and his teaching, of his horrid, degrading, shameful death upon the tree of the cross, and then his victory over death and his destruction of all the enemies of God, and then also, Jesus as the one who’s raised and glorified, the one who’s exalted, the one who’s made the ruler over all things. The psalms are sung with Christ in mind, with Christ in heart. They’re sung with what St. Paul would call “the mind of Christ,” and therefore every single word of the Bible, every single word of the psalms, every psalm taken together, understanding what it’s about, is understood by Christians to refer to Jesus Christ. Having said this, we also would say that the psalms refer to humanity itself, because Jesus is the man. He is the Adam. All of human experience is fulfilled and recapitulated and perfected and accomplished in him. So the Psalter is about humanity also. And the Psalter is about any individual person. Each Psalm is about me and it’s about you because it’s about Christ, and Christ is about us and we are about Christ. And everything he does, he does for us and for our salvation. So this is the way that Christians would sing the psalms. Now, in Orthodox liturgy, the entire Psalter is read through continuously in monasteries once a week. It’s divided into twenty parts. Each part is divided into three parts. And these are just read at the Vespers and the Matins services throughout the week. It begins with Number I on Saturday night. That’s why it begins with “Blessed is the man,” and that’s sung at the Saturday night Vespers service, because it’s the first Psalm, and the Psalm is beginning the Psalter, but it also tells us immediately about Jesus, because the first Psalm says, “Blessed is the man,” and it’s man, male man. It’s not anthrōpos; it’s not “human being.” It’s anēr: Makarios anēr—blessed is the male human being, who walks not in the counsel of [the ungodly], who sits not with the scoffers, who doesn’t go in the way of sinners, who keeps all the commandments of God.” And that man is Jesus. That man is Jesus. So right from the beginning, we’re thinking about Jesus. And the end of the Psalter, the Praises, which finish the Psalter on Saturday morning, the continuous reading, those psalms are read every single morning at Matins. So the Matins and the Hours and the Vespers have their own proper psalms, the psalms that are sung every day. For example, at Vespers, the opening psalm of creation is sung and read at every single Vespers. This is the psalm that speaks about the whole of creation being made by God and glorifying God. Bless the Lord, O my soul. O Lord my God, thou art very great. Thou art clothed with honor and majesty. Thou deckest thyself with light as with a garment. How manifold are thy works, O Lord. In wisdom hast thou made them all. We have come to evening. Man goes forth unto his work until the evening. And so on. That’s in every Vespers. Let my prayer arise in your sight as incense. Lord, I call upon thee; hear me. Hear me, O Lord. Let my prayer arise in thy sight as incense, the lifting of my hands as the evening sacrifice. In Matins, you have always the six morning psalms read every day. You have the 51 st Psalm read at Matins every day. You have the psalms read at the Hours: the First Hour, the Third Hour, the Sixth Hour, the Ninth Hour—each have three fixed psalms that are read all the time. And at the Divine Liturgy, the beginning of the service, after blessing the kingdom and making the all-embracing prayer of the Great Litany, you have the chanting of psalms. And then different psalms are used on different feast days. Certain psalms for Christmas, certain psalms for Epiphany, for example about the Jordan river turning back. Certain psalms about the Cross, all the trees rejoicing and God working salvation in the midst of the earth, looking upon him whom they have pierced. The psalms for holy Pascha: “Let God arise; let his enemies be scattered. Let those who hate him flee from before him. Arise, O God, and judge the earth.” All the victory psalms over the enemies are sung for Holy Pascha. So every word in the Psalter is about God, it’s about Jesus Christ who is God and man, it’s about man, it’s about humanity, and it’s about every single one of us. In the Lenten season, the reading of the psalms is doubled in monasteries. More psalms are sung. More are added to the service, so that people would just, as St. Seraphim of Sarov said, “swim around in the psalms like fish in the water; that’s where we belong.” Or St. Athanasius, in his little letter to Marcellinus on the Psalms: “The Psalms are like a great meadow, a flower garden where there’s all these different flowers where you go around and you smell this one and you smell that one. Or like a symphony of different sounds that anticipate every aspect of human life.” And so in the Psalms you have every aspect of human life. You have questioning of God, lamentation before God. You have grieving before God. You have repenting before God. You have praising God, thanking God, glorifying God. At morning and evening and noonday. All of that is in the Psalter. Now, when it comes specifically to Jesus Christ our Lord, here we have something very peculiar that must be emphasized, and that is this: that in the Psalter, every word about God and Lord and the Savior, it refers to Jesus as well as to God the Father. Every word about God being victorious over his enemies as the King and the Lord, it refers to Jesus as well as to God the Father. Every word about how merciful and kind and loving and forgiving God is refers to Jesus as well as to God the Father. And this is what would be called, in jargon, the theological chanting of the psalms. When the psalms are chanted theologically, all the words that apply to God are applied to the man Jesus. And that is a Christian conviction, because in the New Covenant, absolutely everything that was applied to God in the Old Testament is applied to the man Jesus in the New Testament. This is the Gospel. This is the Gospel, that that man, Jesus, is God, and doing the work of his Father, who is God, in the midst of the earth in human form. Therefore, it is also true that in the Psalms, all the words that speak about human beings, about the righteous man, about the one who keeps the commandments of God, about the one who is just, and all the words about the savior, the redeemer, the king, the judge—all those words in the Psalms apply to Jesus, because he is all of those things. He is the King who reigns forever and ever. He is the Judge of the universe. He is the Savior of all things. He is the Victor over the enemies. So this would be what is called in jargon [an] “economic” reading of and chanting of the Psalms. You read the Psalms theologically and economically—that means according to the oikonomia of God in the salvation of the world. So all the words that have to do about the righteous person and the one who rules in God’s name, the one who teaches in God’s name, all that has to do with the priests and Melchizedek and so on—all this applies directly to Jesus. But then, amazingly, in the Psalter, all the words that apply to the poor and the needy and the oppressed and the rejected and those who are victimized and those who are calling out to God from the depths and those who feel rejected by God and abandoned—that also applies to Jesus, because Jesus identified himself with the poor, the needy, the rejected, the abandoned, the victimized, the victim of evildoers, the one who is ridiculed and shamed. That’s Jesus, too! That’s also Jesus! So God in the Psalter is Jesus. The righteous human beings and the holy ones and the judges and the kings who are victorious in God’s name, that’s Jesus. But the poor, the needy, the lowly, the oppressed, the empty, the victimized, that’s also Jesus, because he took all that upon himself on earth. And then, perhaps more amazing to say in the Psalter is that the penitents, those who mourn over their sins, those who beg for mercy, those who ask God in the words of the psalms to forgive their sins, to wash away their impurities—this, in a sense, can even also be applied to Jesus, because, again, he became a curse for us. He became sin for us. He died for us. He stands, so to speak, before the face of his Father as a penitent and as a petitioner, interceding on behalf of sinners. Now, of course, Jesus is not a sinner himself. He became like us in all things except sin. Nevertheless, the same Apostle Paul says, “He became sin for us.” He became a curse for us. He became a reject for us. He became one who is experiencing, so to speak, the anger and the wrath of God against sinners together with us. So even the penitential psalms in Scripture which we definitely sing on our own behalf—“Have mercy on me, O God, according to your great mercy; according to the multitude of your tender mercies, blot out my iniquities.”—well, Jesus could never say that, because he doesn’t have any iniquities. Or when the same psalm says, “I was brought forth in iniquities, and in sins did my mother conceive me,” that’s simply not true about Jesus. That’s true about all of us, but not about Jesus. But we should also remember when we sing the psalms in the light of Jesus that he came for us, that he came to save us. That the forgiveness and the mercy are what in Scripture is called eleos, the mercy or the steadfast love of God, that it appears that word, “steadfast love of God” or “mercy of God,” “the compassion of God,” it appears in the psalms literally hundreds of times. Literally. I counted them. How many times, it says, for thy mercy endures forever. Thy steadfast love endures forever. In the psalms, the steadfast love guides our way. The steadfast love and mercy of God follows us all the days of our life. The steadfast love and mercy of God goes before us all the days of our life. The steadfast love and mercy of God wakes us up in the morning and puts us to bed at night. The steadfast love of God is what protects us from all our enemies. The steadfast love and mercy of God is what feeds us our food and our drink, that keeps us alive. The steadfast love and mercy of God is what we praise him for, what we thank him for. And that steadfast love and mercy of God is ultimately fulfilled in Christ. It’s given to us through Christ. So that mercy that endures forever that we sing about in the psalms, it is that mercy that comes to us through Jesus who was crucified and glorified. So his crucifixion is found in the psalms: “My God, my God, why have you abandoned me? Why are you so far from helping me?” He shouted and cried those words out on the cross. Nevertheless, when the Psalter says, “Arise, O Lord, and judge the earth, for to you belong the nations. Let God arise; let his enemies be scattered,” that’s also Christ in his victory. That’s Christ in his glory. When it says, “The Lord reigns. He sits upon the cherubim over all creation,” that’s Christ in his ascension and glorification at the right hand of God. And when it says that the kingdom of God that endures forever and reigns forever and ever unto ages of ages, that’s also given to us through Christ, because as the psalm says, “He is the son of David who will sit upon the throne, of whose kingdom there will be no end.” He is the only-begotten of God. He is the firstborn of all creation and the firstborn of the dead. So all these psalms apply to God, to Jesus, to humanity, and to each one of us, each in its different way. So you can hear these psalms in very different ways, and that’s why we sing them and chant them all the time. You know, there’s a canon law of the seventh ecumenical council, canon 2, that says, “No man may be made a bishop who cannot chant the entire Psalter by memory, by heart.” Sometime if we would like to have some fun with our bishops, we could ask them to please recite the Psalter for us, because if they say we must keep the canons, well, one of the canons is to be able to recite the Psalter by heart. Now, most monks and nuns can really do that, because if they’ve been chanting these psalms all the way through once a week, and twice a week in Lent, and using these psalms at all the different services, then they become just part of you. I’m a married man with five children, and I know how my little children are little children who were brought up in church hearing the psalms, how they can sing them, how they know them, how the lines of them stick in their heads. Now if you could imagine hearing these psalms over and over again, chanting them, because it’s easy to remember when it’s sung [rather] than when it’s said, and suppose they were always chanted with the same translation—suppose we didn’t have, you know, how many different translations we had—but that every time we went to church, we would hear the same psalm with the same words, exactly the same every single time—well, those psalms would simply become part of us. They would be, as it were, inscribed in our brains, in our heart. So whatever would happen in our life, words of psalms that were appropriate would pop into our mind and come forth from our heart, from the abundance of our heart the mouth would speak, but when that abundance is filled with God, then our mouth speaks the proper words, and those proper words are always found, somewhere or other, in the Psalter. When we get up, it’s David. When we go to bed, it’s David. When we eat, it’s David. When we are happy, it’s David. When we are thankful, it’s David. When we are confused and troubled, it’s David. When we don’t know what’s going on, we call out in David’s words. When things are terrible and we’re grieving and lamenting and mourning, again it’s the words of David that are on our lips. Whatever happens in our human life, when we’re exhausted and tired, it’s David that is on our lips. Praising, thanking, glorifying, lamenting, questioning—it’s David; it’s the Psalter. So every Christian should really become acquainted with the Psalms. A daily rule for every Christian would be to read, to read out loud, perhaps even to chant in a singing voice, a couple of psalms every day. And then when we go to the church, those psalms should be sung. And one of the sad things is that sometimes in our church worship, we skip the psalms and sing the hymns. Well, shortening the service by skipping the psalms is not highly recommended. We need to know those psalms. They need to become part of us, because they are actually the very words of Christ himself—to us, as the Word that comes from God. And they are our very words, through the same Christ, that are addressed—to God. So Jesus as God and man, he is the one who gives the significance, the meaning, the illumination to all of the Psalms. Once I was at a retreat where the priest was speaking about the Psalms, and he said to the people gathered, “Open up the psalms at any place. Randomly open the book of Psalms, read three or four verses, and I will show you how that psalm ultimately applies to Jesus, and therefore to us as well.” And the people who were at the retreat did it. Four or five different people in different parts of the room just opened a psalm and read some lines, and then the priest who was leading the retreat showed them how those lines tell us about Jesus and about salvation and victory and mercy and life and wisdom of God that is given to us through his Son, the Lord Jesus Christ. How happy we are that we have the Psalter! It is a gift to us from God. As St. Anthony the Great said, “In the Psalms we praise God through the Word, Jesus Christ, by the words that God himself has given to us.” St. Benedict said when we go to church, we don’t put our mouth where our mind is; we don’t tell God what’s on our mind. We may do that in our room; we may do that in the secret of our heart, but when we go to church, we don’t put our mouth where our mind is. We put our mind and our heart where our mouth is. And we listen and hear and attend to the words that are put into our mouth, that are put on our lips when we gather as Church. And most of the time, almost all of the time, those words are the words of the Psalms.